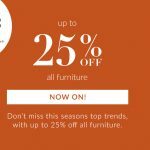 Here at Arighi Bianchi we've just launched our Autumn Event, with up to 25% off all furniture. T&C's: Event discounts do not apply to services such as design, measuring or fitting. Imagery and banners for the Autumn Event are available in the Awin interface or on request.